When Donald Trump became president, there were three groups that knew they would be in his cross hairs - illegal immigrants, Muslims, and the environmental movement. Well, come to think of it, anyone who dares cross his path would feel his wrath. But, that's a whole different topic, that quite frankly is too taxing to write about. I've said it all along that Trump isn't a politician, he's a ruthless businessman right down to the core. If there is one that people high in corporate America really hate, it's regulations. For most Republicans, when they see smoke belching from a stack or raw sewage flowing out of a pipe, the American economy is doing great. As the for the environment? Too bad, just hold your breath and don't swim there. Trump has released his 2018 budget and he's ready to slash and burn the EPA right down to the ground. Trump has made is clear that he's isn't a big fan of the agency. After all, he has gone on the record that climate change is a Chinese-perpetrated hoax and called the Paris Agreement "ridiculous." I read an article about all of the cuts he's seeking and it left me numbed and outraged. One of the programs that slated to be eliminated is the Great Lakes Restoration Initiative. The initiative was created to clean up decades of misuse from toxic wastes, the introduction of invasive species and restoring wetlands. Prior to the initiative, the lakes have benefitted from the enactment of the Clean Water Act and changing attitudes from the general public. However, one of the lakes is starting to show signs that its health is declining is Erie. For the past several years there have a series of large algae blooms popping up on the western basin of the Lake Erie. I've witnessed this massive green carpet stretching for miles in every direction as boats have to plow through it to get to open water. Then there was the contamination of Toledo's drinking water from the same algae and it made national news. 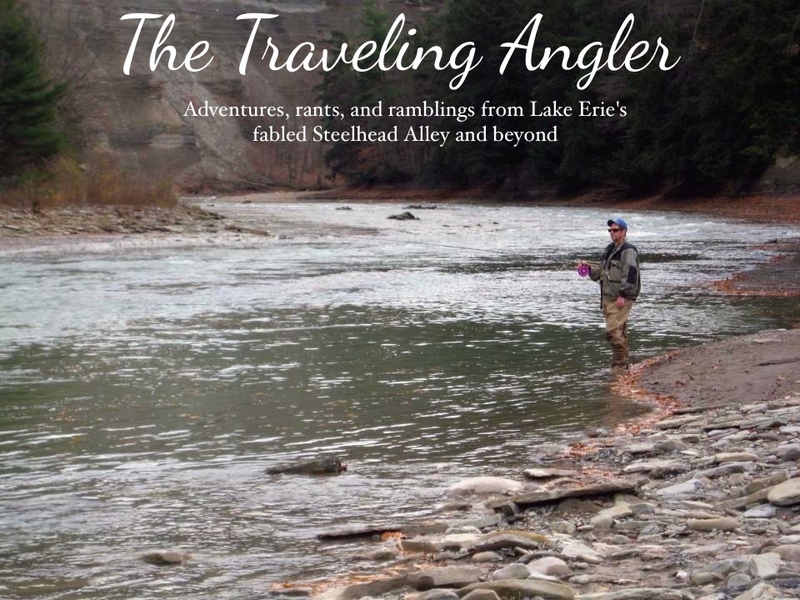 A lot of the older people along the shores of Lake Erie remember all too well seeing the dead fish washing up on shore, the extinction of the blue pike and the Cuyahoga River catching on fire. This generation could very well see the same things happen again if attitudes don't change. But the one that scares me the most is the Asian carp getting into the Great Lakes. For years, politicians have kicked the can down the road on what to do to prevent them from getting into the lakes. When Obama was president, he never addressed the problem during his entire time in office. The electric barrier isn't a 100% and it's a matter of time before they start getting into the lake. Just last week I read an article that carp have breached the barrier and are caught just 9 miles from Lake Michigan. But Trump won't release the study plans to stop the potential invasion. Why? Because it hurts business interests. It's that typical short-sightedness that politicians are famous for. Because if the carp get into the Lake Erie you can pretty well kiss the sports fishery goodbye because they'll practically clean out the lake of any plankton that younger gamefish rely on. We'll be sitting at the bar when we're old and gray talking about the good ole days when we caught walleye, perch, bass, and steelhead all day long. 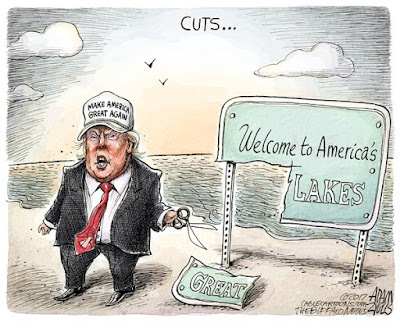 The reality is that Lake Erie and the Great Lakes don't belong to Donald Trump and the Republican party, they belong the American people and it's up to every American to do whatever they can to protect them. 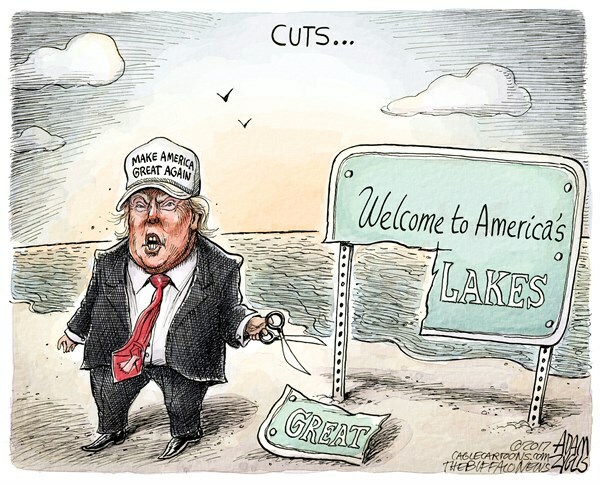 His budget isn't set in stone and the politicians from Ohio, both Republican and Democrat have already said they'll fight the cuts. I'm pretty confident that both the Congress and Senate will sound a loud message that Donald Trump ignorance and greed are not acceptable. Four years can't come fast enough.